Novotel Benoa Bali is nestled on the fringe of Nusa Dua, Bali's southern Peninsula, embracing the golden sands of Tanjung Benoa Beach. Only a twenty minutes drive from Bali's International Airport or five minutes to the traditional fishing village where colorful ceremonies and rituals are a part of the daily life. Coconut wood structures, soft adobe patinas and traditional thatched roofing welcome you into an atmosphere of cool tropical comfort. Novotel Benoa Bali is nestled on the fringe of Nusa Dua, Bali southern peninsula, embracing the golden sands of Tanjung Benoa Beach. The Novotel Benoa Bali resort captures a unique Balinese village atmosphere in a tropical garden setting, complemented by 3 pools, 2 restaurants and 3 bars. There are 180 Deluxe rooms and 12 Beach Cabana rooms. All individual rooms have either their own private balcony or a small garden to relax in. Our evening cultural displays highlight spectacular traditional dance and music while our gallery features exhibitions by Indonesia's leading artists. For the energetic guest we offer daily activities and sports programs. 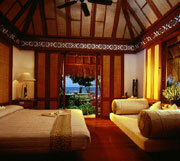 Novotel Benoa offers you a genuine taste of Balinese charm and warm hospitality. 3 Outdoor swimming pools, Meeting rooms, Library, Games Room and In room safe deposit boxes. Others may simply enjoy a relaxing massage. For families our "Dolfi" kids club welcomes all children from ages 15 - 12 years, Evening entertainment, Daily recreation & sport program, Kid's pool, Floodlit tennis court, Watersport Canter, Tour desk, Fitness canter with sauna, Laundry & dry cleaning, and Free shuttle bus to Nusa Dua.